The Olive Canvas, the monthly hip, hop and happening event at Olive Bar & Kitchen, featured gorgeous gowns and dazzling dresses of brand Karleo by Karan Berry and Leon Vaz. It was a demi-couture collection line with Waluscha De Sousa as muse, looking radiant in a frosted jewelled bodice over a satin faced organza striped skirt. Others showing off Karleo creations included Naveli Deshmukh (Miss Diva 2015 second runner-up), Apeksha Porwal (Yamaha Fascino Miss Diva 2017 second runner-up), Shannon Gonsalves (Yamaha Fascino Miss Diva 2017 finalist) and Srishti Vyakaranam (FBB Femina Miss India 2017 finalist). Skyy vodka from Aspri Spriits and The Daily Dose from Wine Park did the rounds, complemented by pizzas and other tasty hors d’oeuvres. Seen at this stylish soiree were guests like Candice Pinto, Mandana Karimi, Deepti Gujral, Suchitra Pillai, Hemangi Parte, Ira Dubey and Nidhi Munim at this event directed by Shamita Singha. Seagram’s Blenders Pride showed off its fashionable side at the Blenders Pride Fashion Tour 2017 at Grand Hyatt. It was time for famed fashion designer Tarun Tahiliani to showcase his stunning creations that saw actor Sonam Kapoor as the shining showstopper. Techno electronica music by Midival Punditz featuring Mame Khan and Malini Awasthy with Mumbai Strings set the tone for the fashion feast that unfolded. The theme this time was ‘Style: More than you Think’ which was a celebration of the authenticity and uniqueness of style. You heard that this was all about breaking stereotypes and defying conventions. The collection on view represented a bohemian rhapsody inspired by the beauty of nomadic tribes and Mughal armoury-inspired art. What you saw were laser etching, zardozi, resham-thread embroidery, aari work, fringing and velvet accents. Needless to say, much Blenders Pride was downed along with gin, vodka and wines. 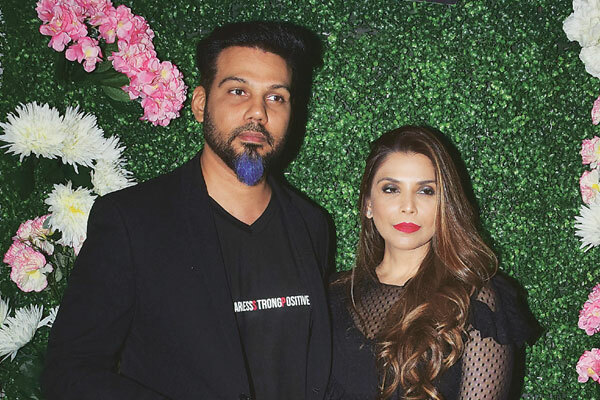 with assorted drinks and tasty bites among guests like Anusha Dandekar, Michelle Poonawala, Ujjwala Raut, Sheetal Mafatlal, among others. Evelyn Sharma at the Seams for Dreams Christmas garage sale at Razzberry Rhinoceros. Razzberry Rhinoceros with its lovely lawn at Juhu Hotel was the lovely location for the Christmas garage sale spearheaded by Seams for Dreams (SFD) founded by actor Evelyn Sharma. Lending support to this cause were Rocky S, Kanika Goyal, Wendell Rodricks, Gavin Miguel, Krishika Lulla, Nishka Lulla, Falguni and Shane Peacock and Gavin Miguel. Konkana Bakshi, Elli Avram, Rochelle Rao, Keith Sequeira, Samir Kochhar and Jenny Rei were among the many guests.